I found this website today, quite by accident, as I was watching the announcement of the 16th visit of Queen Elizabeth soon to come. Her 1st visit had been in 1954 the reporter said. I had a sudden far off memory of crowds and flags in Mosman and wondered whether this was a real or imagined memory. My parents and I must have moved to Muston St, Mosman in very early 1954. Had I seen the Queen? I looked up the web and there I found a photo on your website which corroborated the event. She did indeed come down Military Rd. In fact it must be the earliest memory I have as I was just less than 1 year old. It was never something discussed in childhood, as my parents were definitely not monarchists, though one of them must have been interested enough to stand at the side of the road to watch her go by! And it made an impression on me. 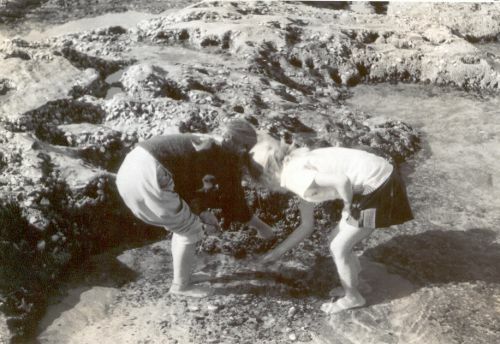 Self and friend Erica Jobling, who lived at 707 Military Rd, playing by the rocks near storm drain outlet near the old jetty. I lived in Mosman from 1954 to 1972 and went to Killarney Pre School (a brown check gingham uniform and the smell of peanut butter sandwiches and afternoon naps on the floor), then to Mosman Infants (Mrs Strang was my teacher, warm milk in the playground and big trees and very high windows) and then the Girls Primary (Mrs Schillmeuller in 3rd Class who got us all performing, and Mrs Quaker). In 6th class we were transitioned to co-education which was very exciting indeed, though the teacher we were given was an ex army sadist and the boys experienced the cane far too often. He was ‘disappeared’ halfway through the year and a more kindly teacher put in his place. Then to Mosman High (Peter Connelly was our art teacher, Miss Parker our maths teacher amongst many others; I still have my old junior high summer uniform from the late 60’s and very short it is indeed. Perhaps I should make an installion with it and donate it to Mosman High!). In Senior High we were fortunate to be gifted the wonderful Don Brown and his team. He set a high bench mark. Mosman was my world and I knew every cove, and almost every rock on the shore, and all the secret paths down to the water fronts, as my father was a keen fisherman who loved finding a quiet rock to cast off from. We would also go for an evening walk almost everyday. Usually to Balmoral or Bradley’s Head but often somewhere off the main beat. For many years we had a two tone green Holden FX that was parked in Muston St. My father would do running repairs and a tune out on the street as we had no garage. Elsewhere on this site there is a photo showing a similar model on Military Rd. Perhaps it was us! I can remember the last trams when I was 5, and the Athol Street Wharf tram nose dive into the harbour! The shops were owned by long term locals, and it was a place where everyone knew everyone else and popping to the shops was a walk not a drive, and many stops were taken along the way chatting to neighbours. Taronga Zoo was a place frequently visited and almost felt like an extension of the backyard, as of course did Balmoral Beach, Mosman Bay, the Spit area and the coves around Beauty Point. A Storm brewing over Middle Harbour taken from our sunroom in the Muston St apartment. This was my world. Day and night. My father was an amateur astronomer and we spent many an hour looking at the stars through his telescope. I also of course used to use the telescope for terrestrial snooping too. All the way to Manly and North Head. I consider myself to be one of the most fortunate of people. I grew up on the eastern side of the central part of Muston St ( now called Balmoral Heights if you please) with a clear view over both North Head and Middle Head though not quite through the Heads! I would spend hours at all times of day, sitting at the window, watching Middle Harbour night and day, the Manly ferries going back and forth, sometimes in wild weather, bushfires on Dobroyd Point, and the purple jacaranda creating a punctuation here and there down the hillsides amongst the houses. I can hear the calling and shouting of children on the beach way down the steep hill at Balmoral drifting up the ridge on a hot day, or coming home tired and happy after a day at the beach myself. The harbour water often looked as though it was an open-cut diamond mine, sparkling and shimmering in the morning light. I often watched the submarines come and go and had a friend who lived in the Captains cottage, now a heritage building, overlooking Clifton Gardens. We often used to get the bus or drive to Bradley’s Head and walk all around the point on the bush path, always at dusk, hearing many animals at the zoo calling goodbye to the day, and watching the sun set behind the Harbour Bridge way to the west. On these walks my father, a keen naturalist, taught me to be observant and to move slowly and quietly, noting nests, and much other wildlife that went unnoticed by most. I can remember him finding a grey fantail sitting on a nest and over a few days of visits the bird trusted us to come within a yard or so to observe. Of course as a child distances seemed so huge. North Head and the Quarantine Station seemed so very far away. 40 years later, on return from living in the UK, Middle Harbour looks like a fishpond in comparison to the childhood recollections of those geographies of youth. I can remember Johnny the young man with learning difficulties who was a local character and someone my father always shared a word with, Billy the dog ( his statue now stands at Balmoral) and his street sweeper master; a couple of elderly women who ran a haberdashery at the northern end of the shops at Mosman Junction (now called the Village! ), another mixed goods store at Spit Junction where the money went up a suckey tube and the change came whizzing back. Walking past the Buena Vista pub and hating the smell of beer and the loud voices of men inside. My mother was a nurse and worked for a Mosman nursing agency on Military Rd before becoming matron of a convalescence home on Bradley’s Head Rd called Strathairlie. many families would recall my mothers care of their sickly relatives in their own homes or in Strathairlie. She then became deputy matron at what was then Greenwich Home of Peace. Her name was Gladys and then she changed it to Jane when she was in her late 40‘s. I used to visit many of the homes she worked in all around Mosman. 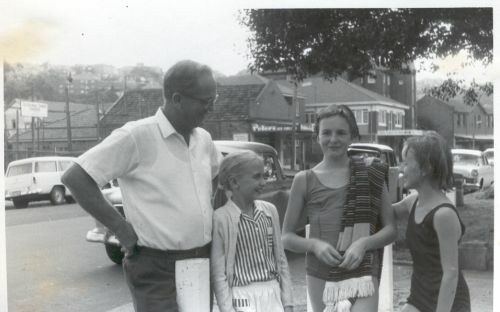 Keith Cairnes, Linda Cairnes age 11, Natalie and Georgina Starr at North End of Esplanade near baths and jetty? Natalie's twin, Nigel is taking the picture. My father was disabled and a house-husband, way before the term was coined. Keith was a prototype of a great home dad. It was a very lonely existence as there was no support for stay at home dads in those days. He rarely told people of his profound deafness and many saw him as quite eccentric when he misunderstood when they chatted with him. However he was charming and was quite a well loved character in the area. I went to school with Georgina and Natalie Starr who lived in a 1st floor flat on the Northern Esplanade. Natalie’s twin was Nigel who was in the Radio Show the Quizz Kids. Nigel used visit us to learn all about astronomy from my father as a teen. I was walked to the Infants school every day and then when older, walked with a group of friends to Mosman Primary using the new traffic lights at the shops near the Lopez Green Grocers. We used to shop at the Solero’s Green Grocers and hang out in the milk bar when we were older. I discovered the Solero family now run a large and prosperous green grocers in both Norton St and Marrickville Metro. Well done them. I can also remember much prejudice against ‘new australians’ at school. Many forget that their own families could only have been in the country for no more than 3 or 4 generations at the time. We are all migrants of some sort. It was a time children were able to walk to friends houses, and pop up the shops after school and explore local territory unaccompanied and as long as we came home for lunch or were home before dark, no questions were asked. We all felt safe. Just after the Mena Hosptal closed I and a friend snuck in the building and crept around the empty rooms until we got too frightened by our own shadows and ran off! It was about the naughtiest thing done in a relatively innocent childhood. My father knew Charmian Clift and George Johnston in their last years, and Bill Wood (a Rhodes Scholar and onetime editor of the Tribune) and his family. Mosman was full of interesting bohemian intellectuals, mostly left of centre, who had moved into the area both for its beauty and the relatively cheap rentals. Mosman had a history of being a creative cultural hub of sorts. Those were the days. 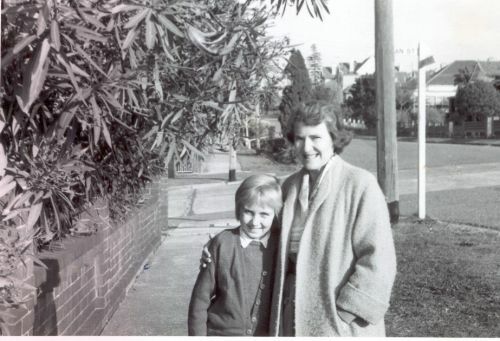 My mother, Gladys Cairnes and self about mid 1960 standing on the corner of Raglan and east side of Muston St. I used to wait on the corner here for my mother to walk home from work at the convalescent home Strathairlie in Bradley's Head Rd, where she was Matron. Of course I took my fantastical environment entirely for granted and it wasn’t until after many years of living in cold grey England that that I realised what an utterly privileged childhood I had. We were poor, living on a nurses wage, but lived in a kingdom of wonder, accessible to all. I think Mosman was my first love. After 36 years in the UK, I have come home to Sydney, and often drive across the bridge early in the morning and walk along the Balmoral Esplanade. I stop outside the block of blue-brick 30’s built flats I lived in, gaze fondly at the same jacaranda I climbed 50 years ago, marvel at the view I once took for granted, and laugh at the memory of that little girl, all that long time ago, sitting on the fence waiting for her mum to walk down Muston St, on her way back home from a long day looking after the elderly and sick. The street looked so long and straight and it and that life seemed they would go on forever. In 1980 after 26 happy years, my parents were forced to move from this beloved address. The landlord had tricked my very deaf father into a misunderstood agreement. Very sadly they could no longer afford to live in beautiful Mosman, or in Sydney. Many others were disenfranchised in much the same way over the years. It broke my fathers heart and he died 3 years later. I don’t know whether I need to be a member to email you ? I now live in UK but fly home every 1-3 years. I have only seen this comment, a full 1.5 yrs later. I have had a couple of emails from people who I went to school with and was mystified how they had emailed me. I clicked and your name and was taken to your Rootweb family site which is excellent. Which number in Muston St did your cousin live in? I still drive past, and have fond memories. Everything looks just the same at 65 Muston St. The jacaranda seems the same size. The building had had no major overhauls, like so many. And nostalgia enables me to become a “friend’ of the zoo each year, simply as an excuse to pop over to Mosman. Blair Gilmour and Tony Shanahan both brought your article to my notice. I enjoyed my six years at Mosman despite some tragedies in the lives of my family. THe freindship and respect from my students was a rich reward and remains so till today. I still keep in touch by phone with some of my level 1 English students and I’m always happy to hear from any of my old students. THank you for your kind words. I’d love to hear more of your life story. Dear Don, I hope this finds you. I have only just seen this message you left, in Jan 2019! We lived at 56 Muston St and used to go through the back lane and sneek through the block of flats to Military Rd to get to school. Was in Tony Shanahan’s class 1968-70 and Don Brown a teacher. I think he was at our reunion at the Rissole Club in 2005, so was Dot Parker. Great times.